There is a little-explored idea that can give your business a competitive edge. And that is, making sure you have access to good conference venues. Meeting for business around a conference table is professional and a great image-booster. These days a video or Powerpoint presentation is essential to communicate what your business is about and the products and services you offer. Clients cluttering around your laptop just doesn’t create the right impression. 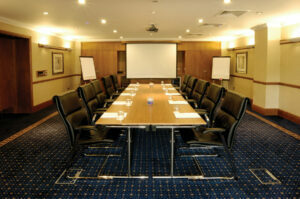 A well-equipped conference room will enable you to project your presentation with greater impact. After the presentation has been shown, there can be discussion around the table and decisions made. 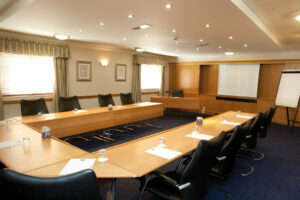 Access to a good conference room with the right facilities is essential for business. Today, designing a conference room is as important as designing the office you work from. There are several considerations. For instance, the choice of the table and matching chairs. Where will you place the table to maximum advantage? Do you have the necessary technology back-up? A technical team that you can have access to whenever you need them, will eliminate tension. When you connect your laptop will everything go smoothly? Small details like this can make even the best-planned meeting lose its impact. A conference room should be conducive to productive discussion. Is the lighting adequate? Are there notepads with sharpened pencils in front of speakers? What about coffee, tea and refreshments? Will lunch be served if the session will last through the day? When can the menu be decided? And where will lunch be served? All these considerations are important. No detail is too small to take into account if you want the meeting to go smoothly. A little imagination and you can make the most of your conference room, depending on the need. For instance, if the room is being used to screen a corporate film, the seating can be made theater-style facing a large screen. This kind of configuration can also be used for training sessions when there’s a speaker standing in front of the audience. A white board can easily be set up. Today, there are smart white boards available so you can even print out points or notes written on the board. Make sure your technology is up-to-date. DBS business centers have been specially designed so that the conference room complements the office you use. They are available in different sizes and capacities. You’ll find that a DBS conference room can play many roles. It can be used for confidential meeting, for recruitment interviews and group discussions. It can be used for seminars and workshops, for training sessions. Whatever the need, you can re-configure the conference room to match. One major advantage of using a DBS conference room is that you don’t have to have one in your own office. This enables businesses stay agile, without the encumbrance of equipping and staffing a conference room which, after all, has limited use through the year. DBS has more experience of handling conferences than its competitors. The center manager can advise a client about what he or she specifically needs to run their conference. With the list agreed on, the client can just focus on making the presentation impactful. In today’s global scenario, it becomes even more important to have access to a well thought-out conference room backed by experienced support staff. It can make all the difference.